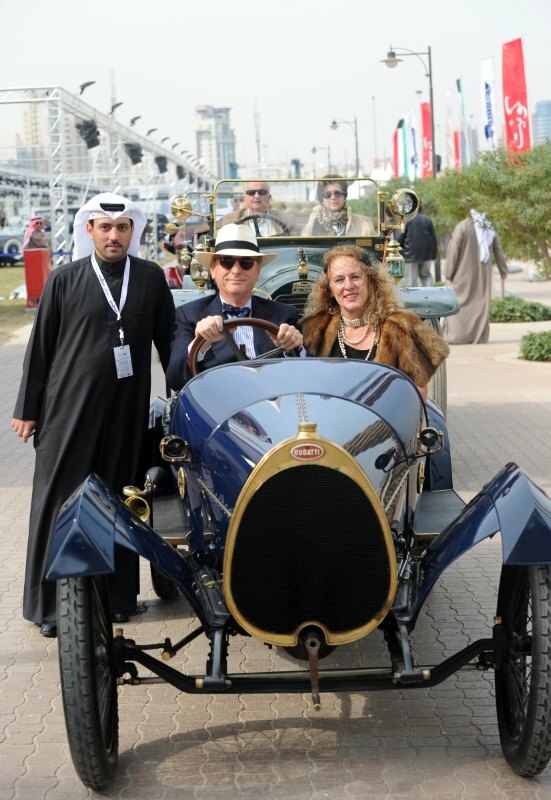 The Kuwait Concours d’Elegance 2011 was held February 2nd to 6th on the Marina World complex in Kuwait City. Clear blue skies and warm temperatures greeted the guests of the 2nd annual Kuwait Concours d’Elegance, the only event of its type in the Middle East. Organized by the Kuwait Historical, Vintage & Classic Cars Museum, the Kuwait Concours d’Elegance has quickly established itself as a premier event, giving the Concours a seat at the table of top-shelf automotive shows worldwide. The show field at the Kuwait Concours d’Elegance 2011 featured elegant, important cars from collectors in Kuwait, Europe, United States and the rest of the Gulf Region. Nearly eighty automobiles competed for the overall honors, grouped together in classes as follows: Class A, 1910 to 1930 – Vintage Cars; Class B, 1931 to 1945 – Classics; Class C, 1946 to 1960 – Postwar Classics; Class D, 1961 to 1975 – Modern Classics. The guest judges assembled were nearly as impressive as the cars being evaluated, headed by Chief Judge Leonardo Fioravanti, designer of the Ferrari Daytona, 288 GTO, 308 GTB and F40, among others. Other notable judges included famed Lamborghini test driver Valentino Balboni; Christopher Bangle, former Chief Designer for BMW; Dr. Ulrich Bez, CEO of Aston Martin; Horst Bruning, president of FIVA; Sandra Button, Executive Director of Pebble Beach Concours d’Elegance; noted designer Tom Tjaarda and Andrea Zagato, current head of Coachwork Zagato. In addition to the automotive luminaries in attendance, none other than former U.K. Prime Minister Tony Blair dropped in on the Kuwait Concours d’Elegance. Blair insisted on a full tour of the Concours field, and discussed, with enthusiasm and knowledge, each car with its proud owner. The schedule of events at Kuwait Concours d’Elegance 2011 offered participants and guests the ability to not only see important automobiles, but also to learn about their history. The series of lectures by the designer judges were a popular attraction, as collectors enjoyed the opportunities to listen to the wisdom and stories of the men behind some of the cars they own. Overseas collectors were impressed with the level of hospitality and VIP treatment they received. Examples included the on-site knitmaster that made beautiful custom covers for every car in the field, the desert trip that included camel rides and lunch in an Arabian tent, capped off with the awards ceremony dinner hosted by His Highness the Prime Minister of Kuwait H. H. Sheikh Nasser Mohammad Al-Sabah. Even with the generosity and warmth bestowed upon participants, no Concours would succeed over time without a strong list of entrants. Fortunately, the Kuwait Concours d’Elegance 2011 attracted impressive cars such as the stunning Alfa Zagato, s/n 10279. Of the approximately thirty 1900 Zagatos built, only two or three have the distinctive double bubble roof as the car on display in Kuwait. The Alfa has also been exhibited at Villa D’Este, Pebble Beach and Amelia Island. Bentley brought along a thunderous 4.5 Litre Blower Bentley GH 6951; seventeenth out of the original fifty, and completed in August 1930 with a Vanden Plas sports four seater body. American cars were well represented, including the rare “W” code Chevelle SS 454 Convertible, one of only 23 known to exist and the only one in this colour. The Chevelle won Best Muscle Car at the Concours, and came over from New Jersey. Best of Show was awarded to the 1934 Mercedes-Benz 380K Kombinationswagen delivered new to the Daimler-Benz Racing Department. The 380 K was raced and tested in period by such notables as Manfred von Brauchitsch and Luigi Fagioli. Sports Car Digest was fortunate to have Senior Photographer, Tim Scott of Fluid Images on hand at the Kuwait Concours. On top of bringing home a winter suntan, Tim also brought the following 200 images found below that give an superb overview of the Kuwait Concours d’Elegance 2011. To see more from Tim, visit fluidimages.co.uk. Outstanding turnout. Truly enjoyed seeing the 1952 Muntz Jet. Tim, as always, your images are superb. Great work. It was nice meeting you Tim. Wonderful job covering so many amazing cars. It’s always great to see how different artists capture such remarkable vehicles. As a first time Concours for my Dad and I as well as our first time in this part of the world we were very impressed! The people were genuinely welcoming and couldn’t do enough for us. We felt “right at home”. For my fellow car entusiasts, if you ever get invited to this marvelous show – accept the invitation without hesitation! Congratulations on winning ‘Best Muscle Car’ – your Chevelle was wonderful. We have plans for a separate story on the American Muscle Cars present in Kuwait. It will run soon. What is the story of the Aston Martin DB4 GT Zagato look alike (photo 6)? Crazy sized wheel arches and wing makes for a likely AMV8 re-bodied? Fabulous photos. Any pictures of the trophies?